Male - emerald green with blue around edges of wings and red underneath. Female - Vivid red with blue underneath wings, purple/blue belly and turquoise around the eye. 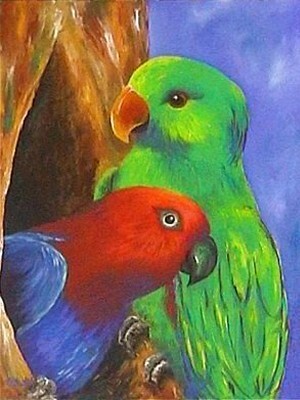 These bright and conspicuous parrots caused endless confusion until it was discovered that they were indeed male and female of the same species. They are found in the rainforests of Cape York and feed on berries, fruit, nuts, seeds and blossoms. The male tends to his partner while she incubates the eggs.